Happy Friday 🙂 You just hit the gifting gold mine! It’s finally here! 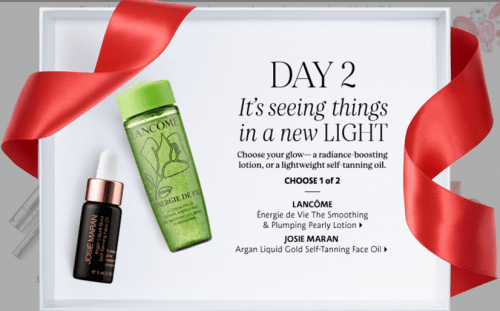 Sephora’25 Days of Sharing the Love’ Holiday promotion is now live! Every day for 25 days Sephora Canada will reveal a new FREE deluxe sample with any $25 online purchase with coupon code! While supplies last. Enter the promo code 25MINIS in the promotion code box at checkout to receive the deluxe sample of your choice based on availability, FREE with any online purchase of $25! Plus, you can choose another 3 FREE sample in your basket at checkout with your purchase! FREE Josie Maran Argan Liquid Gold Self-Tanning Face Oil (at value C$52)! Canada Shipping Details: Shipping is FREE when you spend $50 or more! Click here to shop these deals at Sephora Canada online.